Shirts With Random Triangles: Stillwater, Ok. bookstore wants Oklahoma St. to put the Big 12 title on it's "Chelf." 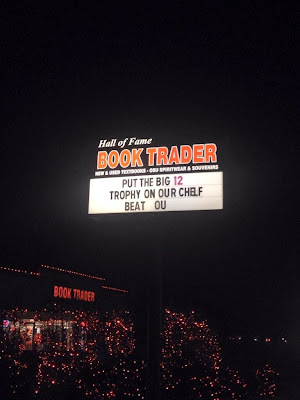 Stillwater, Ok. bookstore wants Oklahoma St. to put the Big 12 title on it's "Chelf." Stillwater, Oklahoma's Hall of Fame Book Trader is getting ready for this weekend's 2013 installment of Bedlam between Oklahoma and Oklahoma State. With a Big 12 title on the line for Oklahoma St., the store proudly wants the Pokes to "Put the Big 12 trophy on our Chelf." The "Chelf" of course being Oklahoma St. starting QB Clint Chelf. Or did you really think that people in Stillwater couldn't spell, you silly Sooner fan you.